Keeping weapons at home is a risky affair. As a licensed gun owner it is necessary that you’re absolutely sure about the safety of your gun. The last thing you would want is some criminal to get hold of your guns and misusing them to their advantage. This is when gun safes come into the picture. Sturdy and solid, these tough all steel gun safes protect your guns from theft and other accidents. But your job’s not over, storing your weapons inside is a safe does not guarantee total security. 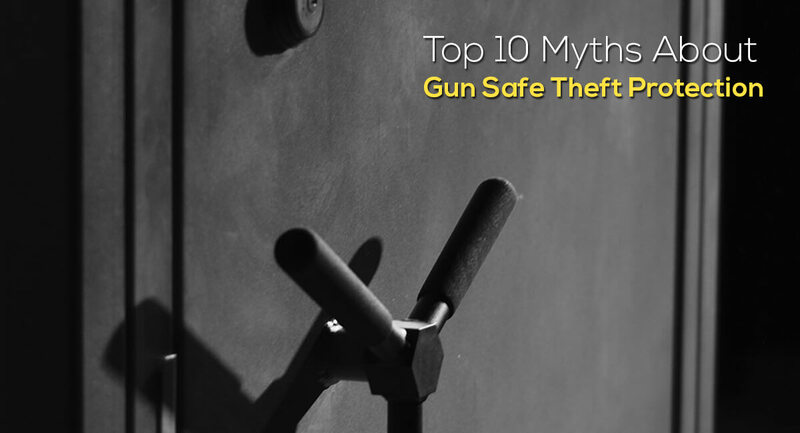 Discussed below are some common myths about gun safes and the actual reality behind them. Contrary to the popular belief, not all gun safes offer equal protection. Just because the various brands specialise in safeguarding firearms does not mean all of them are equally efficient. And before picking any, understand the difference between a gin safe and a cabinet. While both aim at protecting and storing guns, safes are sturdier, heavier and have a much more complex locking system. Cabinets are comparatively easier to crack and are not much of a hassle for criminals. If you’re among those disillusioned people who believe that night time is the dark hour for criminals to emerge out and wreak havoc in your homes then you’re mistaken. Most burglaries happen in broad daylight! Both professional and amateur criminals mostly break in during afternoons when the active family members are away. Also, a safe neighbourhood doesn’t mean it’s immune to all criminal activities; in most cases the criminal found is not some stranger but a known and trusted person who knows the occupants of the house very well. Most gun safes are fire and water resistant, protecting your weapons from both thievery and other accidents involving fire etc. but not all. Some safes and gun cabinets are of inferior quality; the metal framework can rust easily or get some serious damage if set on fire. Also gun safes are no match to natural disasters such as earthquakes and heavy storms. Gun safes do not guarantee total safety of your firearms. Agreed that your guns will be the safest inside a gun safe but storing in loaded guns is taking it to a whole new level! Storing loaded guns is not only impractical but also very dangerous for if it falls into the hands of some criminal he can easily open fire and cause some serious damage. Also it might lead to some unpleasant consequences if somehow the loaded gun gets in the hands of children. This is why most gun safes come with a warning to unload the weapons before storing. Many people believe that heavier the gun safe is, studier and safer it will be. And while this is somewhat true, it does not mean you become complacent about properly locking the door. Bolting the door and anchoring it in place further strengthens the safe, it becomes considerably harder to crack. Most thieves steal the entire safe and then open it at leisure, firmly fixing the gun safe prevents the burglars from dislocating it, also smart anchoring reduces the impacts of axes, hammers and saw etc. With the increase in technology the dependence on the plain old mechanical locks has decreased drastically. People now prefer electronic lock that automatically lock the door once you shut it, unlike the old manual and combination locks. And although electronic locks are better and more technologically advanced they will stop functioning once the main power supply is cut off, a very dangerous prospect that criminals can use to their advantage. Also these locks are usually not shock proof and fire resistant. Having a gun safe to store all your weapons can often lead to complacency and a false sense of security. This is because most people believe that gun safes are enough to discourage criminals from trying to break in to their homes. Gun safes can scare only amateur thieves who just barge into the house in case they get lucky, it cannot deter an experienced criminal. Most burglars have special tools and equipment that can easily crack the safe in no time. While in most cases alarms are known to have prevented thefts, it might not always be a trustworthy option. Criminals now-a-days have many tricks up their sleeve to disable the alarm and break in easily. The electronic alarm might be damaged permanently or disabled for a while using thin telephone wires etc. Where you place your gun safe is important not only for the interior décor of your home but for the security purposes as well. Keeping the safe in the guest room may attract unwanted attention, catching the eye of strangers such as repairmen, salesmen and delivery boys. Placing it in the basement makes it prone to damage during a fire or any other accident, while the garage or garden house is easily accessible. Therefore it is best that you place it at a smart location, the bedroom is the best option. Thick doors offer no special advantage, it is just a simple trick used by gun safe manufacturing companies to dupe naïve customers. Inquire about the safety features and locking systems thoroughly before you buy any gun safe to avoid any theft in the future. All said and done, gun safes offer you effective solutions to all your weapon security concerns. Take your time and carefully choose the perfect gun safe for protecting your weapons from theft.